But by the time the two reporters filed their account of Kennedy's day for the next day's paper, the sentence -- along with any reference to Palin -- had been excised from the story. As the day wore on and reporters continued to badger the candidate with questions, she eventually said enough to cause the Times to reconsider its quick comparison of Kennedy to the Alaska Governor, who famously sparred with reporters -- or ignored them -- throughout the fall campaign. In striking the phrase from its website, the Times is guilty of self-censorship by removing any version of its web account once supplanted by the final version that appeared in the print edition. Essentially, this means that Times reporters are free to make errors, pass mistaken judgements or even commit libel in what amount to first drafts on the website -- with the security of knowing that by morning no record of those web stories will still exist. The removal of the Palin reference also raises questions about what took place between yesterday afternoon and this morning. Did Kennedy handlers see the line yesterday, and pressure the candidate to speak to reporters immediately or risk seeing herself compared to Palin in the print edition this morning? Or did those handlers contact the Times directly, and ask for the offending phrase to be removed? Either way, the line's disappearance raises serious questions about the Times's commitment to maintaining a single standard for everything it publishes -- whether on the web or in the newspaper. In this instance, the removed phrase likely played some role in yesterday's unfolding events, and warranted some mention in today's account. Wiping the record clean of the highly-charged phrase was an act of self-censorship unworthy of the Times. People are finally realizing this? Do you really think it's the first time? The beauty of the setup is that except for cases like this, almost an accident, no one has the first drafts aside from Master Control. To quote another well known rewrite guy, "So what?" Thanks to Anonymous for the suggestion. 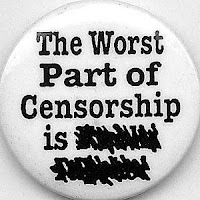 We looked up "censorship" and confirmed that one of its definitions is "deleting parts of publications or correspondence or theatrical performances." Our post referred correctly to "self-censorship" by the Times. In this instance, the self-proclaimed "newspaper of record" deleted, from its own permanent archive, a part of an article published on its website.